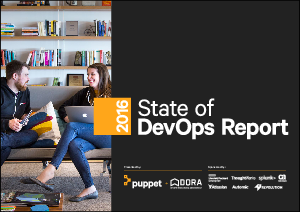 The fifth annual State of DevOps Report, presented by Puppet and DevOps Research & Assessment (DORA), confirms and highlights the fact that achieving higher IT and organizational performance is a team effort spanning development and operations — and it’s an investment that can deliver powerful returns. This year’s report shows how DevOps speeds up delivery, improves quality and security, enhances employee engagement and more. • High-performing IT organization experience 200x more frequent deployments and 24x recovery from failures. • High performers spend 22 percent less time on unplanned work and 29 percent more time on new work, such as features or code. • Taking an experimental approach to product development improves IT performance. The report also helps you understand the ROI of DevOps, and includes formulas to quantify your potential cost savings, using metrics from you own organization.